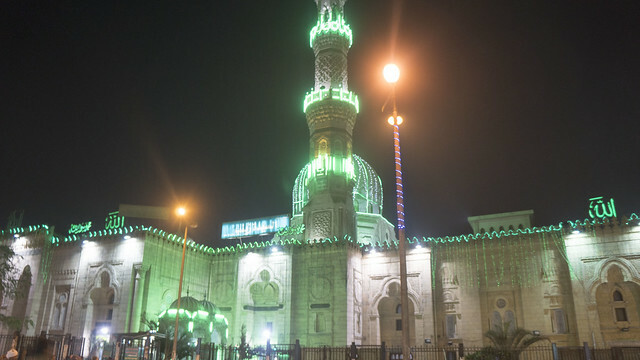 Here are couple of photos of the Great Al-Sayeda Zeinab Mosque on the Mawlid Nabawy or Moulid eve “as we say it in our Egyptian Arabic accent”. I wanted to snap photos on Tuesday for Al-Sayeda Zeinab’s famous seasonal market beside her famous mosque and shrine but I realized that I was too late and I could not go it on the Moulid’s eve because it is the climax of celebration. 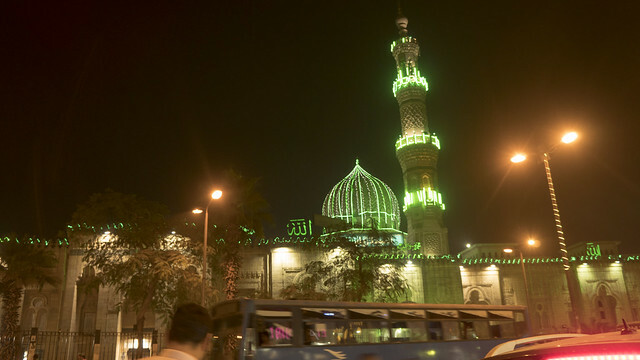 Luckily I snapped a couple of photos for the great Mosque and Shrine for Al-Sayeda Zeinab “Lady Zeinab”, the grand-daughter of Prophet Mohamed “Peace upon them” in the heart of Cairo. 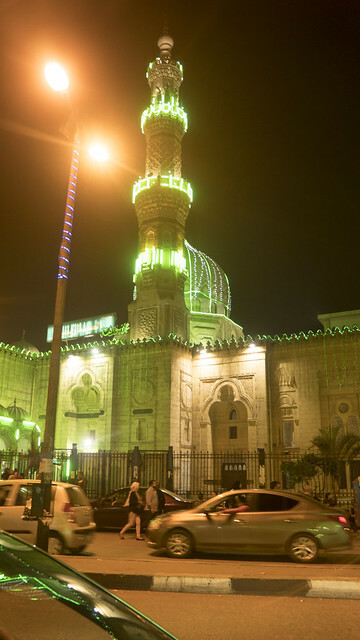 The old mosque which was renovated in 1940 by orders of King Farouk was beautifully decorated with green lights "Sufism plays a role here" for the religious occasion. Wikipedia says inaccurately that the mosque was demolished and rebuilt in 1940 but according to an old photo I found that dates to 1890, the mosque had the same façade. you will find it the same. I won’t enter the debate about whether Lady Zeinab Peace Upon her was buried in Cairo or in Damascus “Iranian revolutionary guards think she is in Damascus and that’s why they invaded the city” but there is fact that the old mention of the mosque as a a shrine for the Prophet Mohamed’s Grand-daughter was in the 16th century Ottoman records that mentioned the renovation works. 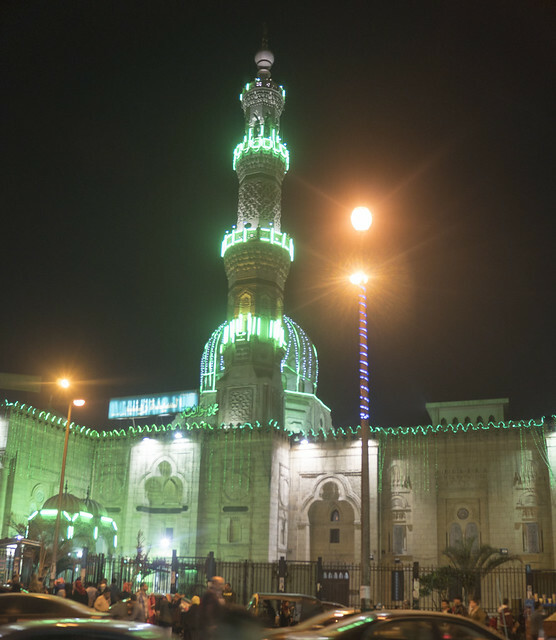 Personally , I tend to believe that Lady Zeinab who is considered the Islamic Saint Patron of Cairo lived in Egypt till her death because I find it hard to believe that she would stay in Damascus, the capital of Umayyads who killed her brother in a brutal battle. Also, Egyptian Sufi orders keep a very detailed history of the arrival of Prophet Mohamed “PBUH”’s family to Egypt that amaze you. The famous seasonal market turns in to a place to sell Moulid sweets and its famous sugar dolls and knights. Hopefully next year, I will speak more about it. I visited that makeshift market before Ramadan and I believe you should see and share those photos again because they are beautiful. I am biased I know. 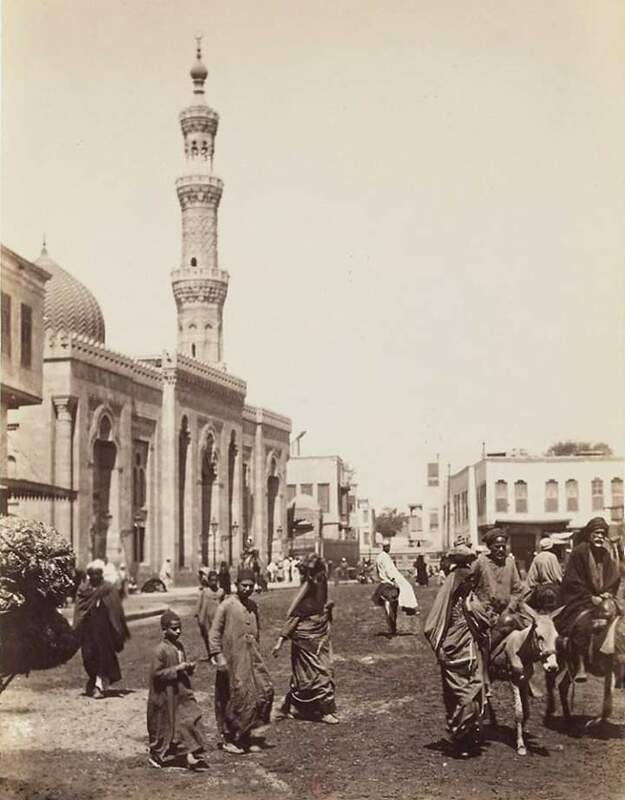 I love all of the historical items you feature on this blog - mosques and pharaonic included. I would love to see a blog about Saad Zaghloul's spectacular tomb, with a commentary from you. It is fascinating that his tomb has no Islamic iconography at all, and this must be unique in Cairo especially for that time.